A woman in western England has died from Novichok just a few miles from where Russian ex-spy Sergei Skripal and his daughter were attacked by the same nerve agent four months prior. Police are still investigating how a 45-year-old man named Charlie Rowley and a woman named Dawn Sturgess came into contact with an item contaminated with the deadly nerve agent. Novichok was developed by the Soviet military during the Cold War and was recently used against a former UK double agent who spied against Russia. The dead of Sturgess is being investigated as a murder, according to police. The attack back in March prompted Western nations to expel all Russian diplomats for the first time since the Cold War. British allies sided with their view that Moscow was either responsible directly or indirectly citing that it was intentional or they had lost control of the nerve agent. Moscow reacted by expelling Western diplomats from its borders. Prime Minister May commented on the death saying she was appalled and shocked by the death of Sturgess. The poisoning of the Skripals with the nerve agent Novichok was the first known use of a chemical weapon on European soil since World War 2. Russia is currently hosting the World Cup and has denied any involvement in the incident with the Skripals. Police say that the 45-year-old man Charlie Rowley remains in critical condition. Russia even went to so far as to suggest British security services had carried out the attack to spur anti-Moscow sentiment. Neil Basu, the head of UK Counter Terrorism policing, said the death of Sturgess was "shocking and tragic news". Basu added, "Dawn leaves behind her family, including three children, and our thoughts and prayers are with them at this extremely difficult time." It was initially believed that the pair had overdosed on heroin or crack cocaine. 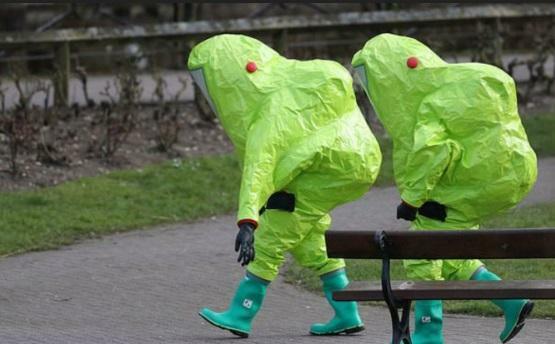 Police have a working hypothesis that the two incidents with Novichok are related but plan on taking no further sanctions against Russia. it was Boris and Natasha in a failed hit on Bullwinkle.